When the weather is pleasant, there are few things as refreshing as cooking dinner outside. However, if you don’t have adequate cooking space, you’re going to struggle with even the simplest weeknight meals. ​Other homeowners encounter the issue of running back and forth from the oven indoors to the BBQ grill outside. With a new outdoor kitchen, however, you can drastically reduce your nightly struggles. Brick Mason Atlanta is your experienced outdoor kitchen contractor, helping more area residents experience their best home addition for less each time. When you need the best outdoor kitchen builders in Atlanta, Georgia, look no further than us. Call today for your new outdoor kitchen creations. We guarantee an exterior cooking space that you’ll love using all year round. Most homeowners think that a custom outdoor kitchen project is going to cost a fortune. However, when you hire an experienced team of masonry service experts, we save you more time and money in the process. We have helped more homeowners experience their favorite yard additions with custom touches that allow your home’s personality to shine through. Whether you need something functional that makes meal preparation a breeze or an outdoor bar and grill space, we can bring your ideas to life. No matter what your preferred cooking source may be, we can ensure that you get the exterior kitchen you’ll love using every night. From contemporary styles to classic kitchen creations, we can achieve the best finish results possible. And more custom kitchen creations for your yard. Some homeowners just aren’t sure about building a kitchen outside. After all, aren’t cooking areas meant to remain clean? However, outdoor kitchen areas are safe, efficient, and provide many years of service preparing a variety of your favorite meals. Whether you’re a BBQ grill master or you’ve never attempted an outdoor dinner, we ensure that you receive everything that you need. Outdoor kitchens create a ton of value and curb appeal, and it makes entertaining guests simple. By creating a seating area or even an outdoor bar, you’ll have no problem communicating and cooking at the same time. Making meals outdoors also provides faster cleanup afterward. By just collecting a few balls of crumpled foil, your indoor kitchen remains spotless! 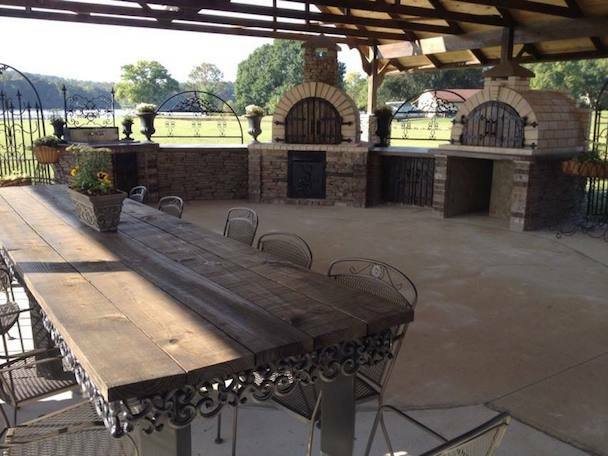 let us create your outdoor kitchen! Homeowners who have already had their exterior meal spaces created swear by them. In fact, many find that they barely use their indoor kitchen during the warmer months. If you need a customized addition that provides plenty of function, you can’t go wrong with an outdoor kitchen area. Call Brick Mason Atlanta for your best barbecue spaces at lower pricing.